Box Text: "Sky Skipper" is a shooting action game released in 1981 by Nintendo. Dodge enemy attacks and counterattack with your bombs! Get even more points by saving the right combination of 4 animals! Don't forget to go and replenish your fuel when you run low. 07-30-2018 badATchaos Box Text "Sky Skipper" is a shooting action game released in 1981 by Nintendo. Dodge enemy attacks and counterattack with your bombs! Get even more points by saving the right combination of 4 animals! Don't forget to go and replenish your fuel when you run low. The "Arcade Archives" series has faithfully reproduced many classic Arcade masterpieces. Players can change various game settings such as game difficulty, and also reproduce the atmosphere of arcade display settings at that time. Players can also compete against each other from all over the world with their high scores. Please enjoy the masterpiece that built a generation for video games. This is a list of VGCollect users who have Arcade Archives Sky Skipper in their Collection. This is a list of VGCollect users who have Arcade Archives Sky Skipper in their Sell List. 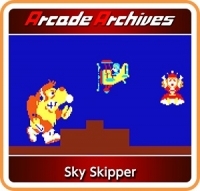 This is a list of VGCollect users who have Arcade Archives Sky Skipper in their Wish List.